In case you haven’t heard, broccoli is pretty trendy right now. (Sorry, cauliflower, but you finally have some competition.) It tastes good raw, dipped in a zesty dressing, steamed and incorporated into a stir-fry, and yes, ground up and used as pizza crust. What a time to be alive. While you’ve probably been hearing that broccoli is good for you since you were a kid, people don’t often talk about the reasons why. Well, wonder no more. What are the biggest broccoli benefits I should know about? 2. 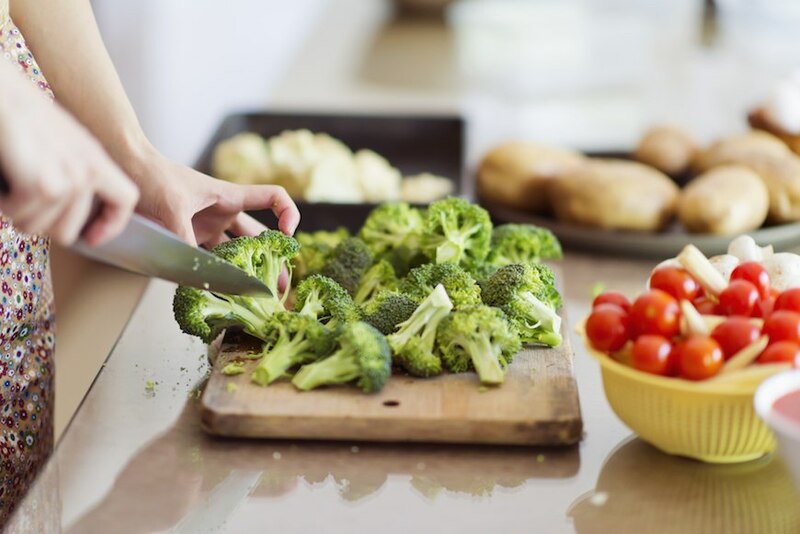 Broccoli is full of vitamins A, B6, and K. Those little broccoli stalks are good sources of vitamins A, B6, and K. Together, these nutrients help keep the immune system up (vitamin A), keep blood flowing and supporting calcium absorption (vitamin K), and building muscle (vitamin B6). 3. It has a ton of vitamin C. One cup of raw, chopped broccoli has 82 grams of vitamin C—more than what you’d get in a whole orange. So if you’re not a citrus person (or you just need a palate cleanser), consider broccoli your unsung immunity booster. 4. Eating broccoli supports a healthy metabolism. Like other veggies, broccoli has fiber (nearly 3 grams per chopped cup) which is key for keeping the digestive system functioning properly. Fiber is also a superstar nutrient for supporting a healthy metabolism and weight loss. 5. Eating broccoli could help reduce cancer risk. Broccoli is a good source of phytochemicals, including glucosinolates, which has been linked to helping prevent cancer. Cabbage and cauliflower are also good sources of glucosinolates, so stir-frying them all together is definitely a good (and delicious) idea. 6. It’s full of antioxidants. Another reason why eating broccoli can help protect against cancer is because it’s full of antioxidants, which help lower inflammation and protect the body from free radicals. Literally every part of broccoli is beneficial in this way, so fill up on the stalks, stems, leaves…all of it. Maybe you always hated broccoli as a kid. But given its health benefits, don’t you think it’s worth giving it another shot? 1. Roast it. The easiest way to eat broccoli is to cut it into florets, toss it with olive oil and your favorite spices, and roast it in the oven until crispy. For a more advanced version, try this recipe, which has a bit of heat thanks to the smoked sweet paprika. 2. Puree it into soup. Cut up your broccoli and puree it in the blender and turn it into a nourishing soup on the stovetop. You can combine other nutrient-dense veggies and inflammation-fighting spices, like turmeric, for a rounded out dish. 3. Use it as pizza crust. Trader Joe’s sells a pizza crust made of broccoli *and* kale, giving another super simple way to up your broccoli consumption. Or, you can make your own broccoli pizza crust by following the same steps as you would to make cauliflower crust. 4. Add it to your casseroles. Another easy way to incorporate broccoli into your food more is to supplement your pasta with broccoli when making pasta or casserole dishes. By not replacing the noodles completely, you’re still satisfying your craving for pasta, but incorporating the broccoli makes the meal much more nutrient-dense than it would be otherwise. Whether it’s adding a handful of whole broccolis to your dish, ricing them, or pulsing them and incorporating them, get creative and experiment. There’s no end to what you can do with the vegetable—and your body will greatly benefit. For more healthy recipe ideas, check out these ones, which are the most pinned on Pinterest. And all of these can be made in 15 minutes or less.